Más de 400 metros cuadrados de construcción que incluye 3 dormitorios 3 baños, además de cuarto de baño de servicio adicional. Esta casa ofrece gran cocina del chef, formal de estudio / biblioteca, sala de estar con TV de pantalla plana, cable y Wi-fi, y un amplio comedor. Tiene un patio central que conduce a la zona de la piscina y barbacoa. También cuenta con un garaje y porche. Está ubicado a solo un par de cuadras del hotel Hyatt y del Paseo Montejo, a poca distancia de las principales atracciones. El nuevo Centro Internacional de Convenciones de Yucatán también se encuentra a solo 1 1/2 cuadras de la propiedad. La electricidad no está incluido. Second time down to this beautiful home. Another great experience. Thanks so much. Its been nearly 2 months since I and I still have not received back my very large safety dollar deposit. I sent an email concerning this and received an email back stating it would take "A few Days" after they discount energy! When I gave the keys back to this guy I asked him to his face if their would be any problem with my deposit to which he said "NOTHING AT ALL" and now I want to know where is my security deposit? Careful with renting this property!!! Unfortunately as with almost all rental homes in Mérida electricity usage is not included in the price of the rental. This is explained on the listing and at checkout. I calculate the usage by taking a photo upon check in and check out and take my readings to CFE, the Federal electricity commission, and they give me a cost in pesos of the usage. If used responsibly, not running A/C's while not in the house, the usage amount is reasonable. In this case the amount used according to CFE was over $10,000 pesos for the time period rented. This was our first time renting a house during an extended vacation. It was a wonderful experience. The house was well maintained and convenient to everything we needed. We did not rent a car. We used public transportation with great ease. Our stay was enhanced by Steve and Ruby, the management team. Their knowledge of Merida was very helpful. They advised about local markets, bus routes and popular sites we might have overlooked. They welcomed us on our first night with a basket of fruit and visited once a week during our 50 day vacation. Any concerns were addressed immediately. We had a great time!!! The house, people of Merida and Steve and Ruby made our time there memorable and exceptional. 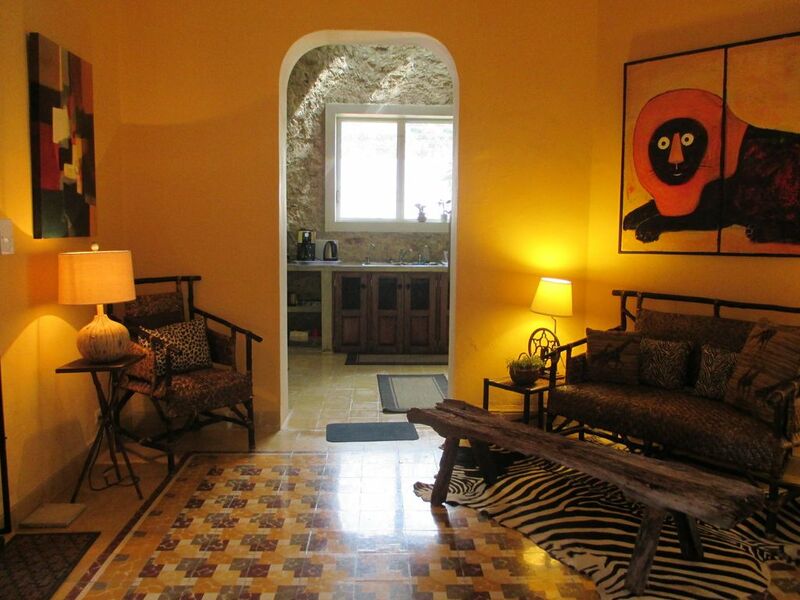 We loved the location and high quality amenities of this beautiful home in Merida. We did not cook anything but breakfast though the kitchen is about as well stocked as anything we've seen. The pool area and patio are quiet, very clean and relaxing. Photos do not do this home justice. You have to see it to believe it. Steve was very accommodating about anything we needed. Stay could not have been better. We would stay here again and recommend it highly. Thank you Bob for the kind words. Also thank you for being such considerate guests in our property. Hope to see you back next year!!! This house is a beautiful house in a safe neighborhood, and is convenient to the Paseo Montejo. The two best features for us was a lovely pool and a kitchen with a professional stove. We were able to have a few friends over and cook a magnificent dinner for them with my friend who is professional chef. I couldn't recommend this place higher. We stayed for the month of February. Our beautiful colonial in Garcia Gineres was everything we had hoped for. When we arrived, we were welcomed with a huge basket of fruit and a bottle of wine. It was our oasis in the city. Close to the Paseo de Montejo and all of the great restaurants. We walked everywhere. Our house was very clean and was more beautiful than shown on the site. like old friends. They provided us with lots of good information about things to see and do in Merida. parking is a real bonus in the city. the wonderful service they offered. Many thanks. Mérida es una ciudad moderna, cosmopolita, con museos, galerías de arte, restaurantes, tiendas y boutiques. Un importante centro de comercio, Mérida Yucatán se considera el cruce de la región y uno de los lugares más importantes para experimentar la herencia maya. Electricity usage during your stay is not included and will be deducted from the damage deposit. If the electricity usage exceeds the amount of the damage deposit the amount due will be collected upon check out.